This filling, colorful meal is festive, nutritious, and well-balanced. You can serve as a main dish for a special occasion, and everyone loves it as it is friendly to different tastes. This is a healthy alternative to pan-fried chicken breasts and combines lean meat, fresh vegetables, and herbs and seasoning. Goat cheese-stuffed chicken breasts are flavorful and tasty and are one of our kids' favorites. It's also such a hit with company. This dish is impressive and tempting with a mouth-watering blend of colors and flavors. 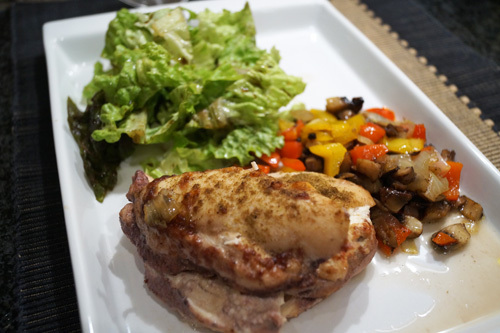 Chicken is moist and tender and combines so well with mushrooms and peppers. Make a pocket in each chicken breast half using a sharp knife. Combine lime juice, butter, goat cheese, thyme, and salt in a bowl. Make equally-sized plugs and fill in chicken breasts. Press slightly. Preheat oven to 200 C. Use a baking dish, oil slightly, and put the chicken breasts. Bake for 50 - 60 minutes or until golden and crisp. Remove from oven and leave aside. De-seed the red and yellow bell pepper and remove the core. Slice the peppers intro strips. Use a large pan, preheat olive oil, and add onion. Cook for 2 - 3 minutes and add garlic. Cook for 1 - 2 minutes and add the mushrooms, stir occasionally. After 4 - 5 minutes add the peppers and cook for 4 - 5 more minutes. Season with salt and pepper and balsamic vinegar and cook for 8 - 10 more minutes. Serve chicken breasts with medley and green salad. Garnish with basil.